This is a viewing guide for the History Channel's Mini-Series America The Story Of Us. There is one question for approximately every three minutes of video, giving students an opportunity to watch more than they write, yet still helping them pay attention. 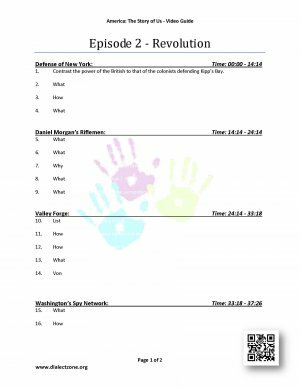 You may purchase a video guide worksheet / answer key for each episode separately or the complete set. * This purchase is for you and your classroom only. * Duplication for an entire school, an entire school system, or for commercial purposes is strictly forbidden. * Please have other teachers purchase their own copy. * If you are a school or district interested in purchasing multiple licenses, please contact us for a volume discount quote.